This is a follow-up of the Private /tmp mount per-process in Linux. As already stated there, Linux namespaces offer great options for security. In this article we will demonstrate the use of the “network” namespace which enables a process to have independent IPv4 and IPv6 stacks, network interfaces, IP routing tables, iptables firewall rules, the /proc/net and /sys/class/net directory trees, sockets, etc. # We are in a "/bin/bash" session in the NEW network namespace now. # You can now drop privileges and launch a daemon which will use this confined network namespace. Pros: Using separate network namespaces gives us full network isolation and control over a group of processes. Additionally, we can match incoming packets against a process which is not possible in a standard “iptables” setup using the “-m owner” match extension. These are huge security benefits. Cons: The technical implications are that the Linux host has to do (a lot) more work because of the DNAT/SNAT operations and their related connection tracking overhead. If you are running a high traffic server, you should plan and test accordingly. 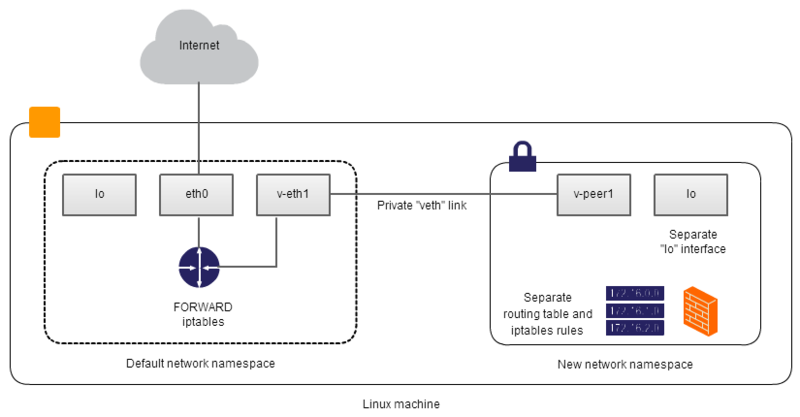 Furthermore, one additional network interfaces pair is created for each new network namespace. Linux can handle hundreds of network devices but still this is a factor to be considered. The better security features outweigh the drawbacks in most use-cases though. Last but not least, it is very easily to run a process with completely detached network and this won’t cost us anything on the Linux host. Categories: Linux | Tags: Linux, Linux namespace, nsenter, security, veth | Permalink.